Anna Saldo Burke is a retired educator who worked closely with BARKA Foundation for years in the process of teaching her 3rd grade students about the Water Cycle. While working at the Sullivan Elementary School in North Adams, MA, Anna devised a unique and creative technique for students to observe and make artwork of “the color of water”. Each painting was incredibly unique and beautiful. Anna pioneered an innovative “krinkle technique” to give these works of art a closer look and feel to actual water. In exemplary fashion of Service Learning (taking education outside the classroom into the community), the artwork was then hung in a local North Adams art gallery where they were auctioned to collect funds to donate to The BARKA Foundation for its well drilling efforts in Burkina Faso. Anna and her classes over the years raised over $2000 for BARKA, and Anna continues to be a dedicated and committed donor herself, years after she has retired. We wanted to share with you Anna’s recent letter and sample artworks to remind us of what we built together and the maturation of BARKA’s work since those early days. Greetings! I am sending this to you in anticipation of your arrival to the U.S. Your good works are evident in your updates, and which brings me joy and happiness. 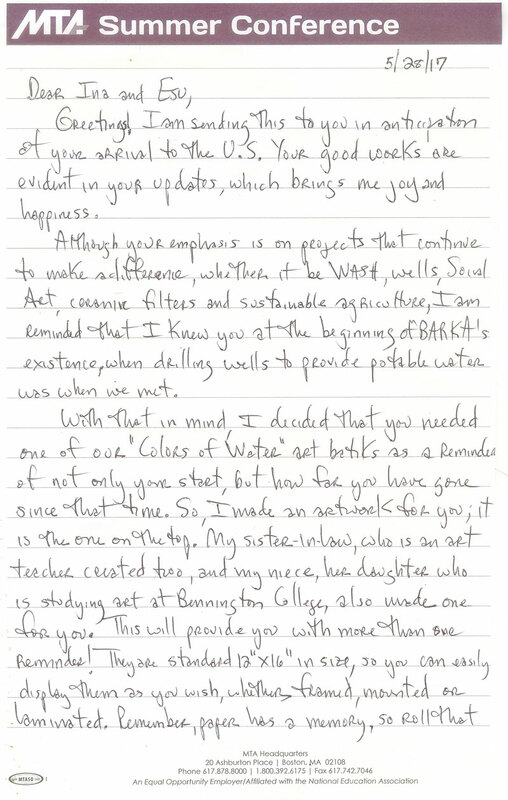 Although your emphasis is on projects that continue to make a difference, whether it be WASH, wells, Social Art, ceramic filters and sustainable agriculture, I am reminded that I knew you at the beginning of BARKA’s existence, when drilling wells to provide potable water was when we met. I hope these artworks will serve as reminders of the great work you are doing, and since water is necessary for life, it may be a colorful way to catch attention and bring it to mind. “Water is Essential” was the name of our project, and the varying “Colors of Water” are beautiful, and was how we raised donations, whether as artwork or paper bead necklaces. It is only befitting that you as a source of inspiration, have a reminder of that. It does not sound as though illness or anything else affected you on this trip. Although your work is gratifying it is also hard work. But, you know how hard life is for others, so you just do your best and help in as many ways as you can. 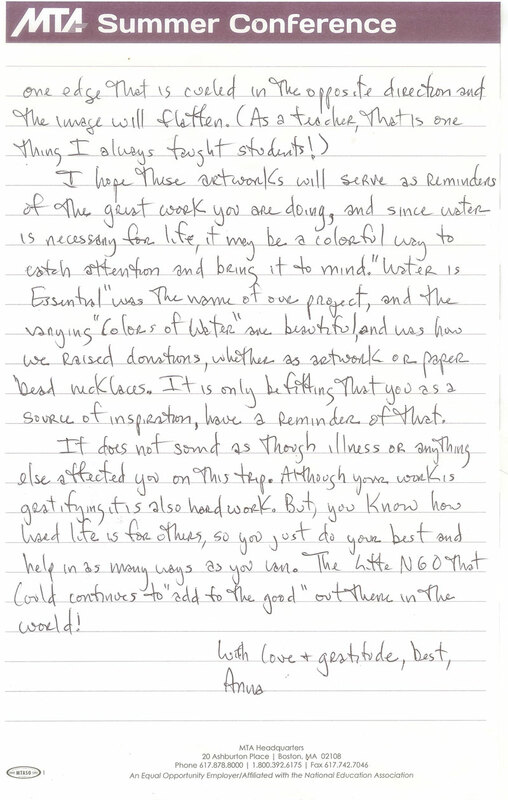 The Little NGO that Could continues to “add to the good” out there in the world! Support BARKA with a donation today.